Between remembering to pack everything and the long lines at the airport, traveling can be an anxiety-producing experience. The least you can do is make the trip a little easier with a special suitcase designed to help you through the struggle. This large piece of luggage is a lot more than just a wheely bag. Should you need to navigate the airport corridors more nimbly, you can use the hidden strap underneath to carry it like a large backpack. You can also detach the miniature backpack attached to the front for streamlined movement after setting up camp. The main compartment is lined with plenty of storage pockets to keep your various belongings organized, and the back pocket even has a drain port for damp items. This adaptable suitcase starts as a rolling bag, but can transform into a backpack or duffel. The material is lightweight yet durable, and when you're not using it, it can be collapsed for easy storage. It’s perfect for people who live in small homes or apartments and don’t have extra room to stow large luggage. After a successful Kickstarter campaign, the Space Case 1 is now available for pre-order. The luggage is so futuristic, you can unlock it with your fingerprint (or an app, if you prefer). It also has global tracking capabilities, so you can always locate your bag, no matter where it is. It even lets you know when your bag is nearby (like when it enters the baggage carousel). For heavy packers, the suitcase also has a digital self-scale that you can use to weigh your bag, and read on the corresponding app, and avoid overweight fees. Not enough bells and whistles for you? The Space Case 1 also has charging ports, a Bluetooth speakerphone, and a 10-year cloud protection warrantee. This leather weekend bag is equal parts stylish and practical. It has an outside pouch to hold things travelers need to access easily, like a phone, passport, pens, plugs, and other items. Leather straps keeps the items safe and organized throughout your trip. You also have the option, at an extra cost, to equip your bag with Karma Go—a device that lets you take Wi-Fi with you on the go. 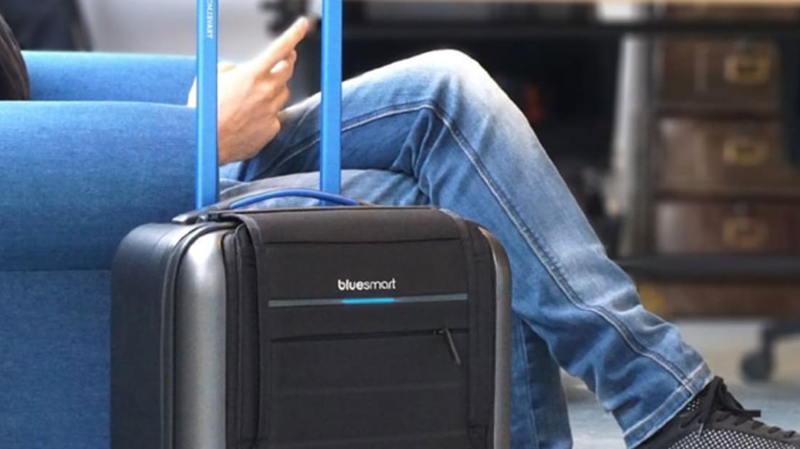 This special suitcase connects to your smartphone, so you’ll always know where your luggage is and can lock it remotely if you get separated. It also has a built-in scale, so you can find out how much it weighs just by picking it up, and a phone charger. This lightweight hard-shelled roller bag is perfect for keeping all your belongings safe. It also comes with a cradle to safely place your tablet on when you need a work surface while in transit. Despite its compact size, this backpack can fit a lot of stuff. Inside, there are plenty of pockets for everything from your laptop to your pens. The sleek round style gives plenty of room without looking bulky, and the waterproof material keeps your belongings safe from water damage. This light-weight duffel bag is perfect for people who want a bag they can just throw everything into and hit the road. When you’re not using it, the bag folds up into an impossibly small package that can be stored anywhere. This durable hard-shelled suitcase can fit a lot more than you’d think: 14 shirts, two toiletry bags, four pairs of shoes, six pairs of pants, and two coats, to be exact. It also has a TSA-approved lock. If you're a little hard on your luggage, you might be sick of constantly ripping your duffel bags. Herschel created a new kind of material called Sealtech that can heal itself using just your body heat. Simply rub the location of the small hole with your hands and seal it right up. This duffel has sturdy leather straps and black metal hardware. So this isn’t a piece of luggage, but it can turn any suitcase into a smart suitcase. The luggage locator uses cellular and Bluetooth technology to track down your bag if it ever gets lost. It retains battery life for 15 days and shows the location information on your smartphone.